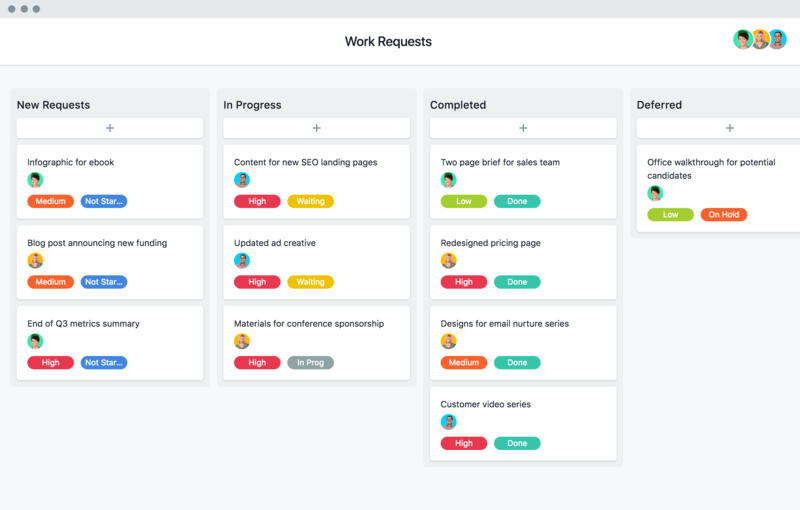 Use this template to centralize, prioritize, and manage all of the requests your team receives—so everyone knows what to focus on and can hit their deadlines. Requests for work can come out of nowhere and derail your team’s priorities. Without a clear system for capturing and tracking requests, priorities can fall to the wayside and your team can quickly become overwhelmed. By using a template in Asana to centralize and manage all work requests, your team can tackle work more effectively. Get important details up front. Standardize the request intake process to ensure all important information is included so work can be actioned effectively at the start. Keep requests organized. Track all requests in one place so it’s clear who is working on each task and when it’s due—instead of everyone having their own system that only they can see. Make priorities clear. Keep your team focused on urgent, high-priority work by making these clear in the template. You can have more control over bandwidth and prevent busy work. By streamlining your work request process, your team will know what to focus on so they can do their best work. How did Sophos' corporate marketing team turn around 11,000 request tasks in 6 months? Better tracking. Cut the chaos that kills creativity by learning how to track and prioritize incoming creative requests. See how to use our template and manage work with a quick tutorial. Track all of your requests in one place so nothing slips through the cracks and your team can do their best work with a trial of Asana Premium.